Marvel and Netflix continue their astonishing run of critical success, this time with Luke Cage. First seen in Jessica Jones, Luke Cage follows the story of it's titular hero (Mike Colter) who finds himself in Harlem, trying to lay low and avoid confronting the many ghosts of his past. When Harlem's local crime boss, Cottonmouth Stokes (Mahershala Ali) seeking revenge for an arms deal gone wrong mows down Luke's employer, local barber and legend Henry 'Pop' Hunter (Frankie Faison), Luke realizes that he can use his strength and invulnerability to do some good and starts retaliating against Cottonmouth. 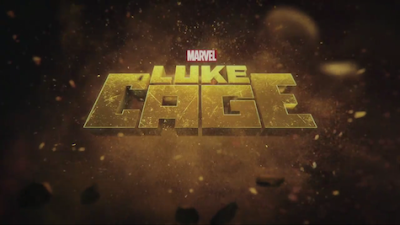 But Luke quickly realizes that he might have more than he bargained for on his hands, as Cottonmouth's cousin Mariah, (Alfre Woodard), a local politician with ambitions of her own proves to be a more formidable opponent than Luke realized, turning the community against him and leaving his isolated, on the run and with only Detective Misty Knight (Simone Missick) and Claire Temple (Rosario Dawson, reprising her role from Daredevil and Jessica Jones) as his allies and a ghost from his past looming in the form of the powerful arms dealer Diamondback (Erik LaRay Harvey) who Luke must face in the biggest battle of them all. There. I think that's a pretty decent synopsis that doesn't spoil too much- I can never seem to do credible summaries of the shows/movies I review and Luke Cage was no exception- because there are a few twists and turns I really don't want to give away if you haven't seen the show- but man oh man, is there a lot to talk about with this show. First of all: you can't escape how timely this is. A superhero who is African-American, bulletproof, super strong and wears a hoodie? Luke Cage is a hero for the modern age, that's for sure. But here's the deal: the show isn't afraid to talk about the complexities of race, but it doesn't get bogged down in it either. Second, it portrays Harlem, like Hell's Kitchen as a very real place and that real brings the focus down from the lofty heights and Hollywood-ized New York City that people are used to seeing to something that feels a lot more visceral, gritty and well, real world than you might expect. Third: I don't think it's all that big of a secret that women and minorities aren't that well written on television or in the movies for that matter- there are exceptions to this rule, but Luke Cage was like a breath of fresh air. Every single character in this show feels well-written, full developed and completely three dimensional. It's sad that the writing feels like such a revelation to me, but I can't discount the possibility that it's just me and not everyone else. There's a lot to like about this show. The overall tone of the show acknowledges the blaxploitation roots of it's character, but does so in a contemporary way. There's a nod to the comics, as Luke just happens to find a yellow blouse and a tiara looking thing that made up his costume in one of his first appearances as Power Man. (You saw a similar nod in Jessica Jones and her costume.) Mike Colter continues perfectly inhabit this role. Simone Missick absolutely owns every scene she's in as Detective Misty Knight. (In the comics, her character has popped up everywhere- including X-Men.) Rosario Dawson continues to be compelling as Claire Temple- I don't know where they're planning on taking her character, but she continues to be intriguing to watch as she makes her way through the Marvel Netflix Universe. We're almost to The Defenders. Iron Fist is up next... every single one of these shows has left me waiting and wanting more. Marvel and Netflix have managed to take these characters and turn them into compelling appointment television. That's an achievement in and of itself.